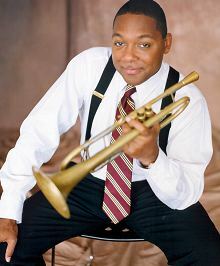 We saw the Wynton Marsalis Septet today at the California Center for the Arts in Escondido. It was wonderful. We had second and third row seats. Marsalis on trumpet was joined by a piano, bass, percussion, trombone, and two saxophonists. All six of them were impressive, to say the least. Susan commented that the tenor player, who also played a few wonderful clarinet solos, was very good. Later, after browsing the web a bit, I found out that he is the "director of jazz" at Juilliard. Okay, maybe she knows what she's talking about. Marsalis seems to play his trumpet effortlessly, achieving and controlling from the instrument all sorts of tones and moods that most players only stumble upon by accident.